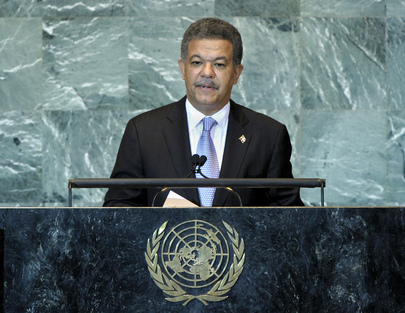 LEONEL FERNÁNDEZ REYNA, President of the Dominican Republic, said soon after the terrorist attacks on New York a decade ago, the war in Afghanistan had begun, producing a larger number of victims than those killed in the 2001 attacks. Later, Iraq was occupied, spurring controversy in international public opinion and contributing to more violence, victims, suffering and destruction. The lesson to be learned was that there must be a collective effort to eliminate terrorism as an inhumane practice, as well as the economic, social, political, cultural, ideological and religious causes behind it, and promote a world that was more open, tolerant, respectful and willing to engage in dialogue. He said that the global financial crisis also shook the world, with international capital markets making demands for States to pay debts that had been created, to a large extent, to save financial institutions from collapse in the first place. As a result, Governments had agreed to severe austerity measures, decreasing citizens’ quality of life, leading to social unrest through protest movements that eroded the Governments’ legitimacy and support base. Resources were needed to save the international financial system, stabilize the world economy, and return to levels of growth and prosperity, and those funds were available, in some of the $4 trillion circulating daily in financial transactions in capital markets, which remained untaxed.A tax of 5 per cent on those transactions would generate $20 billion per day, which would solve problems related to some countries’ sovereign debt, with enough left over for investing, thus allowing a rapid recovery from the current financial and economic world crisis. Another option would be to find the $10 trillion in reported tax havens. The crisis continued, however, with citizens becoming indignant at their worsening living conditions; social demonstrations were multiplying; and Governments were threatened with chaos and uncertainty, he said. He highlighted the financial speculation of the price of food and oil, about which his country was submitting a draft resolution to the General Assembly. Rising food and oil prices, from 2006 to 2008, had seen a soy increase of 107 per cent, corn of 125 per cent, rice of 127 per cent and wheat of 136 per cent. His country considered the need to propose regulating measures to guarantee market transparency and price stability, he said. It was essential to set limits on the volume of transactions in futures markets by the participants, such as insurance companies, investment banks and pension funds, which were in no way involved in the physical handling of the product, as well as to increase deposit guarantees supplied in futures contracts as a disincentive to speculative transactions that contributed to price volatility. The objective of the resolution was simple: getting the United Nations General Assembly to declare, for the sake of the human race, that food could not be considered a financial asset. “Food must be used only to guarantee the survival of the human race on the face of the Earth,” he concluded.